June 14. Twenty-four years ago today I became a mother! Daughter Elizabeth is 24 and a mother herself now. In honor of her birthday, the girls and I will go to her house to spend the day with Elizabeth and her 21-month-old daughter, Abigail. We will go past daughter Susan’s house and take her and baby Jennifer with us. Elizabeth told us she will make breakfast for all of us. We will take lunch in to her. It’s always fun spending time with my children and grandchildren. Daughter Verena regrets that she has to work and can’t spend the day with us. She just left for work at 5:30 a.m. I decided to write this column while all is quiet yet. My husband, Joe, left for work at 3:45 a.m. and son Benjamin left at 4:30 a.m. for his job. As I sit here and think back 24 years ago, so many memories come to mind. When Elizabeth was born, Joe and I were still living with my parents. It was nice being close to my mother as I cared for my first baby. Being a mother is special, but it takes many prayers and much patience to raise children. I am far from perfect, but I want to always try my best. I have been truly blessed in so many ways. Next month Joe and I will have our silver anniversary! Unbelievable! Twenty-five years have gone too fast! Yesterday son Joseph and I were working in the garden. Its still too wet to till, but we were weeding. Oh my! I could not believe how the weeds grew with all the recent rain we’ve had. The tomatoes, peppers, and corn all look like they are growing well, but are behind when compared to other years. It was a wet spring and hard to get the garden planted. Farmers are having a challenge with getting all their crops out. Tomorrow night we will put in hay. Always good to see the haymow filled for the winter. I managed to get the clothes for nephew Levi’s wedding cut out and now I just need to get them sewn. Next Friday daughter Susan is a cook at the wedding of their neighbor girl. She is sewing a gray dress for that wedding. She will bring it along today and we will help her get it done. Life is more demanding after you have a child, so it gets to be harder to get things accomplished. I told Susan I would rather sew than wash dishes today. Lovina hopes that border collie Buddy stays away from any skunks outside. There is a strong smell of a skunk coming in the windows all morning. I really hope Mr. 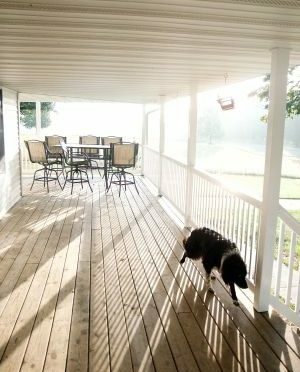 Skunk decides to leave soon! And hopefully our border collie dog, Buddy, does not try to fight with him. But the sun is peeping through and it looks promising for a nice day. What a joy after a lot of rainy days lately. It was a great turnout at the book signing in Colon, Michigan. Thanks to all the readers who came! All my daughters and granddaughters joined me for the evening, which makes it even more enjoyable. Does anyone have a good recipe for peanut butter pudding? 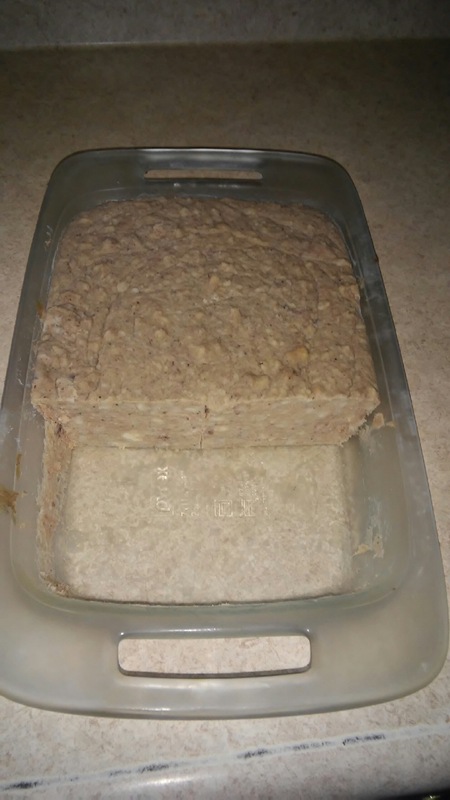 A reader requested that recipe. Meanwhile, this zucchini recipe looks good, once zucchini season starts! Cut each zucchini in half, lengthwise. Place cut side down in large skillet; add 1/2 inch water. Bring to a boil, reduce heat and simmer until zucchini are crisp-tender, about 5 minutes. Remove and drain water. Sauté together sausage, onion and garlic until sausage is browned; drain. Add oregano, corn and tomato. Cook and stir until heated through. Remove from heat and stir in 2/3 cup cheese; set aside. Scoop out and discard seeds from zucchini. Spoon sausage mixture into zucchini shells. 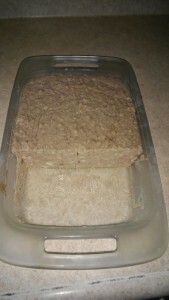 Place in greased 9 x 13-inch baking pan. Sprinkle with remaining cheese. Bake uncovered at 375 degrees for 12–15 minutes or until heated through. 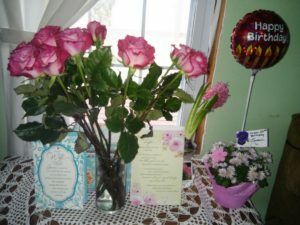 Daughter Susan had her 22nd birthday on January 24. We had cake and ice cream for Susan after supper. I will never forget how glad I was when my midwife (Joe’s aunt Sylvia) arrived the day Susan was born. It was blowing snow, and the roads were drifting shut. Susan was born at 2:37 pm, and she was 6 pounds and 19 inches long. After Susan was born the storm continued, but we were finally able to find a ride to get Aunt Sylvia home. Aunt Sylvia was a very good midwife and always by our side when I had my first six babies. She had a lot of patience. I think having quite a few children of her own made her an understanding midwife. One of the hardest things when we made the move to Michigan was not having her for my midwife and her good advice. 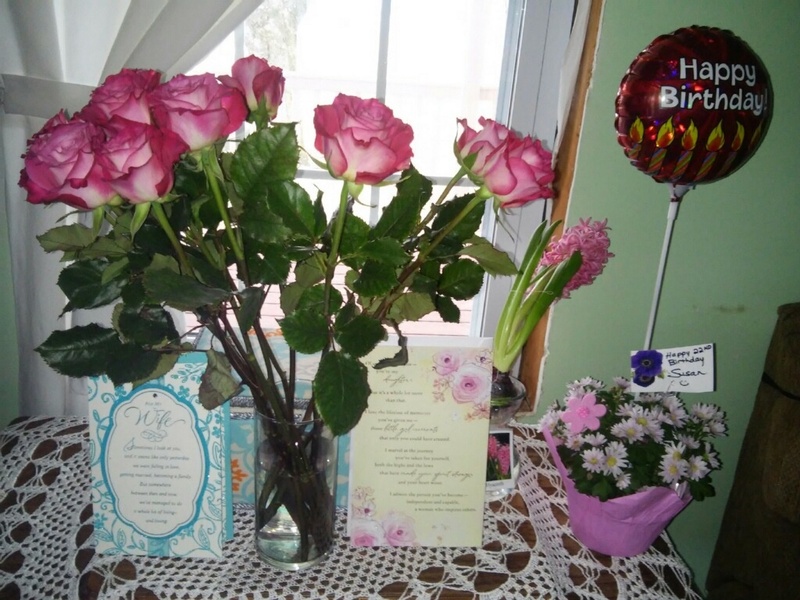 Susan has a January birthday—along with her new daughter and others in the family—which she celebrated with some beautiful birthday flowers. Baby Jennifer is ten days old today. Her checkup with the doctor shows that everything looks good. She is a few ounces below her birth weight, but that’s normal. She grew an inch and is 21 inches, 8 pounds, 6 ounces now. We are still having so much fun having her at our house! They are staying here while Susan recovers from toxemia. Susan is doing better every day and gaining her strength back. She needs to go get a blood test in a few weeks and another checkup at the doctor to make sure everything is healing okay. Jennifer is nursing well, and is very demanding when feeding time comes. Mose is finding out how babies keep you awake at night. He is a good daddy, and enjoys spending time with their firstborn. The church ladies have a birthday basket that is passed from one lady to the next when a birthday comes. On your birthday, you take out what is in it and fill it up with whatever you want to give to the person who has the next birthday after you. Edna brought the basket to Susan yesterday and took a peek at little Jennifer. Susan needs to have it filled by tomorrow for Karen’s birthday. A covered cake pan is also passed with the birthday basket. Susan received chocolate bars and now needs to bake something for Karen. The girls will probably do it for her, since she has her hands full with the baby. Sister Liz’s 49th birthday was yesterday also. So Susan was born on her 27th birthday. We wish her a happy birthday also and good health and God’s blessings in the year ahead and always! Meanwhile sister Emma, Jacob and family are preparing to host church services Sunday. They all had the flu after they were home from Jacob’s father’s funeral. Daughter Verena and I went to help Emma on Tuesday. Emma has brand-new oak cabinets now and is having fun finally getting her dishes back into cabinets since they started remodeling their house. On Saturday Joe wants to help son-in-law Timothy get some work done that he needs to do before they host the next church services. I will go along and help Elizabeth with her work. The next two weeks will go fast for them. Son-in-law Mose went to their own place last night to check up on everything, and discovered a broken water pipe in their laundry room. It brought the ceiling down and made a huge mess. Now they will need to get that repaired before they can move back home. It seems when it rains it pours, but it could be lots worse. Loretta is waiting on me to go help wash laundry. We hang the clothes on the lines in the basement during these cold winter months. We let it hang until the next morning before we bring it up, fold, and put away. I was hoping to go help sister Emma again tomorrow. Time will tell if I get that far. Stay healthy everyone! The flu is making its rounds, and I wish everyone the best of health through this flu season. God bless! Brown the sausage; drain. Beat eggs in a bowl. 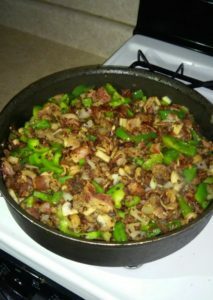 Add onions, green peppers and seasonings. Stir in sausage and cheese. Spoon by 1/3 cupfuls into muffin tins that are either greased or hold cupcake liners. Bake at 350 degrees for 20–25 minutes or until a knife inserted near the center comes out clean. Yields one dozen. We have entered the month of February. The temperature has dropped to the teens again, and we have had several more inches of snow. Last Friday the girls and I helped daughter Elizabeth with the final preparations for hosting church services on Sunday, January 29. Joe and I and the children went again Saturday so Joe and the boys could help Timothy set up the church benches in their basement. The girls and I helped Elizabeth peel the eggs she had cooked for egg salad. We also mixed the peanut butter spread. I made cheese spread here at home on Friday night. Elizabeth prepared two big roasters with casserole for Sunday evening. It makes it easier to have these prepared so they can simply be put in the oven Sunday afternoon for supper. Timothy and Elizabeth were both really organized and finished everything that needed to be done by late Friday afternoon. They do not have the biggest basement to host church services in, but there was plenty of room to seat everyone. A lot of Timothy’s family from other church districts attended, but we had a few families missing from our church district. Those families were attending baptismal services in another church district. So it all worked out well. The menu for lunch consisted of homemade wheat and white bread, egg salad, peanut butter spread, cheese spread, pickles, red beets, hot peppers, raspberry jam, butter, coffee and spearmint tea. For dessert there were chocolate chip, peanut butter, sugar, and oatmeal cookies. Loretta’s friend Dustin surprised Lovina by volunteering to make his special skillet meal. The recipe appears in this week’s column. On Friday night after coming home from helping Elizabeth, I had a nice surprise. Loretta’s special friend Dustin came with groceries and prepared supper for us. This was such a treat to me, as I had been thinking that I would have to come home and prepare supper yet. For the recipe this week, I will share one of the dishes he made for us. I hope you will enjoy it as much as we did. Since Dustin doesn’t have a recipe for this dish, he helped me write one down the best we could. I told him I would name it Dustin’s Skillet, and he laughed. I have left the not-so-good news for last. Sister Susan had been sick for a while and couldn’t attend church services at Timothy and Elizabeth’s house. Monday morning she ended up in the emergency room and was admitted to the hospital. She was there three days and then released to come home. Little Abigail had a cough and it worsened over the weekend. Elizabeth took her to the doctor on Monday morning. The doctor said she has bronchitis and croup. Since they don’t have insurance, the doctor said they could try treating her at home for one night, giving her breathing treatments with a nebulizer. We still have the nebulizer that we had to use a lot on son Kevin, so they borrowed that. Elizabeth took Abigail back to the doctor the next day, and she was better than before. They are still giving her the treatments, and she seems to be getting better. Sweet little baby: she could still smile at us even though she had a fever. I’m thankful sister Susan and Abigail are both on the mend. Good health means so much! May God bless you, and may you stay healthy. Thanks to all you readers for keeping Verena and our family in your prayers. In a skillet, fry together sausage, bacon and shrimp until sausage and bacon are cooked. Drain grease and put skillet back on burner. Add chopped green pepper and onions. Cook briefly. Then add sliced mushrooms and stir while heating until vegetables are hot.